Our readings this Sunday show that what Isaiah foretold long ago is fulfilled by Jesus who comes to save us, to open our ears and our hearts to the word of God. In our first reading (Isaiah 35:4-7), Isaiah offers consolation and restoration to a people afflicted and oppressed by the evils of their time. In many ways, our world today is just as afflicted and oppressed by the evils of our time. In our Gospel reading (Mark 7:31-37), Jesus entered into the pagan territory of the Decapolis, where their ears were closed to the word of God. 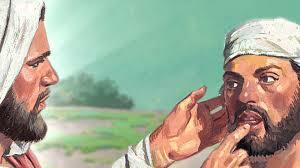 Jesus healed a deaf man with a speech impediment, echoing Isaiah's prophesy of our first reading. They were astonished and declare, "He has done all things well." In our Epistle reading (James 2:1-5), St. James teaches us that human dignity is not determined by wealth or status. Our faith in the "glorious Lord Jesus Christ" is the great equalizer. Christians show no partiality between the rich and the poor, the weak and the strong, the powerful and the powerless. Jesus' healing of the deaf and dumb man should be seen also for it's deeper, spiritual significance. It is Jesus who "comes with recompense to save us." It is He who opens our ears to the Gospel and allows us to speak what we hear. It is He who takes us away from the cacophony of voices that drown out God , who touches us and whispers in our ear, "Ephphatha - be opened!". And it is He who gives us the grace and the courage to proclaim the good news that we hear. Speak Lord, your servant is listening.